Australasian Higher Education Evaluation Forum (AHEEF) 2008 "Evidence based Decision Making: Scholarship and Practice" 2-3 October, 2008 Australasian Higher. 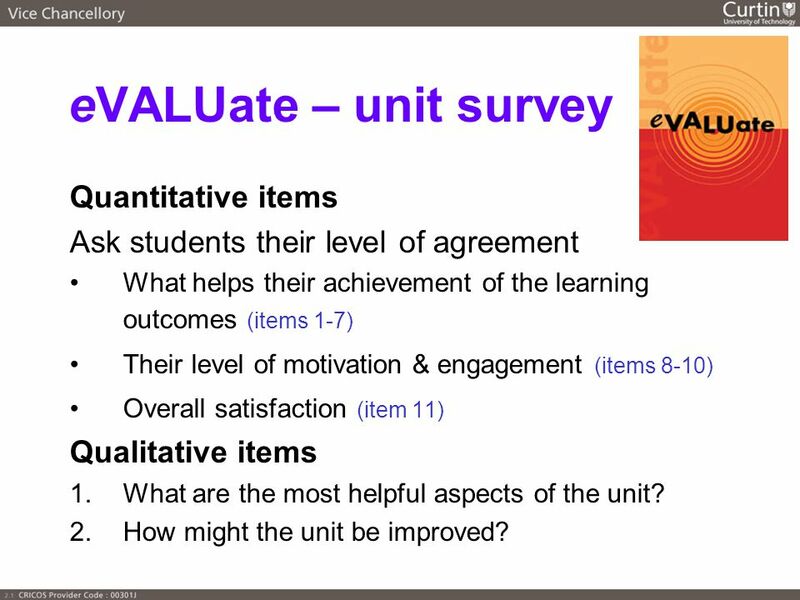 2 eVALUate – unit survey Quantitative items Ask students their level of agreement What helps their achievement of the learning outcomes (items 1-7) Their level of motivation & engagement (items 8-10) Overall satisfaction (item 11) Qualitative items 1.What are the most helpful aspects of the unit? 2.How might the unit be improved? 3 Motivation 8. 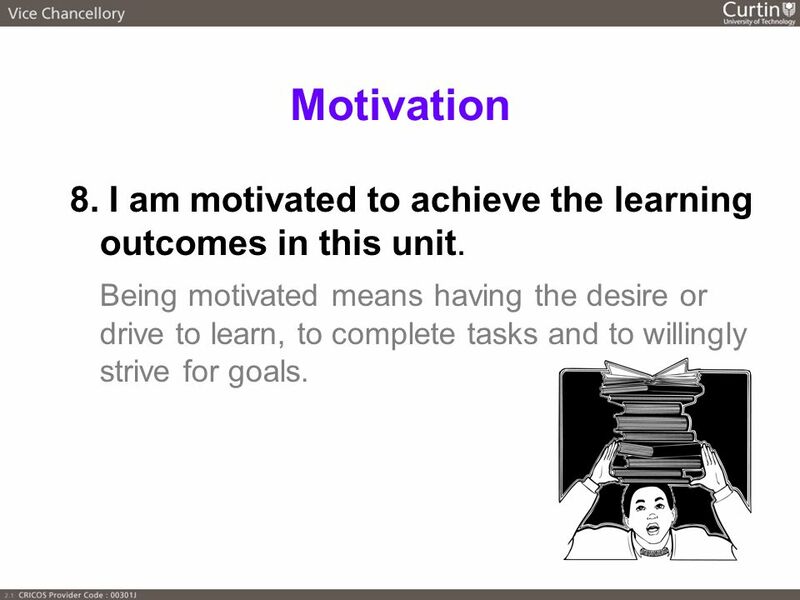 I am motivated to achieve the learning outcomes in this unit. Being motivated means having the desire or drive to learn, to complete tasks and to willingly strive for goals. 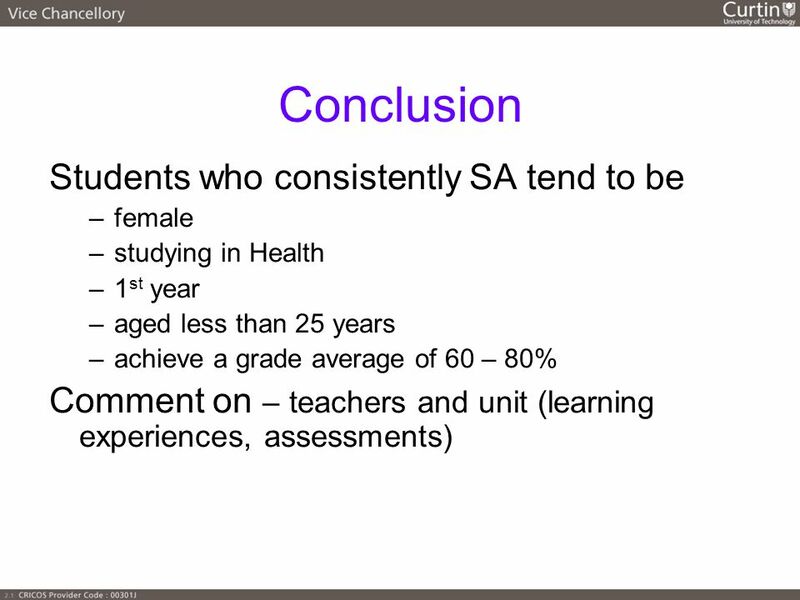 4 Previous Research Findings Higher % agreement motivation *Females *Part-time students *International students *Older students (26 yrs+) *PG students *External students *Higher grades (SWA) Health and Humanities vs Business and especially * Science and Engineering. 5 Research questions 1. 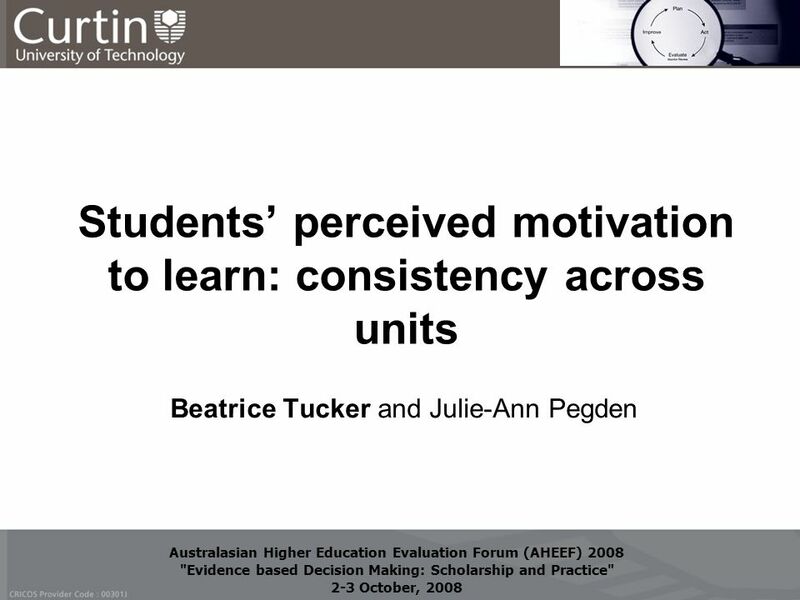 Are students consistent in their reported level of motivation across units? 2. If so – what are their characteristics? 3. 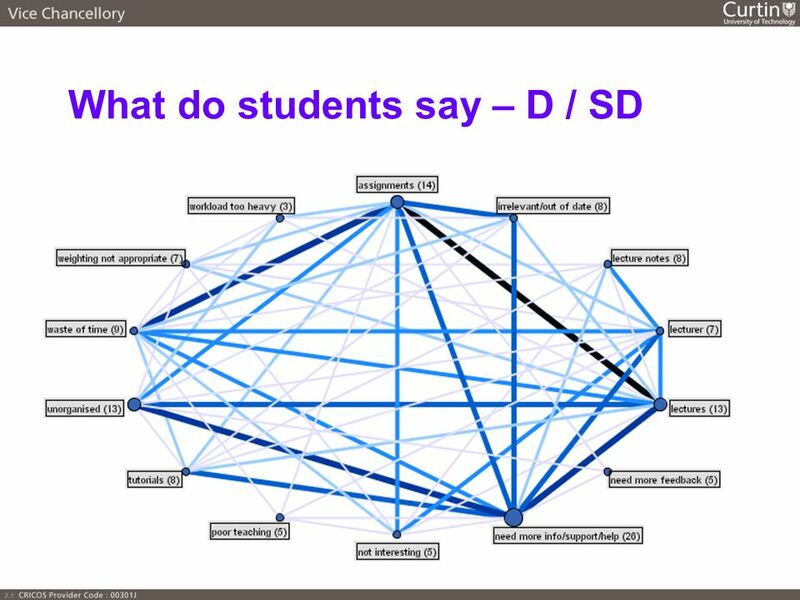 What factors motivate them? – what do they say? 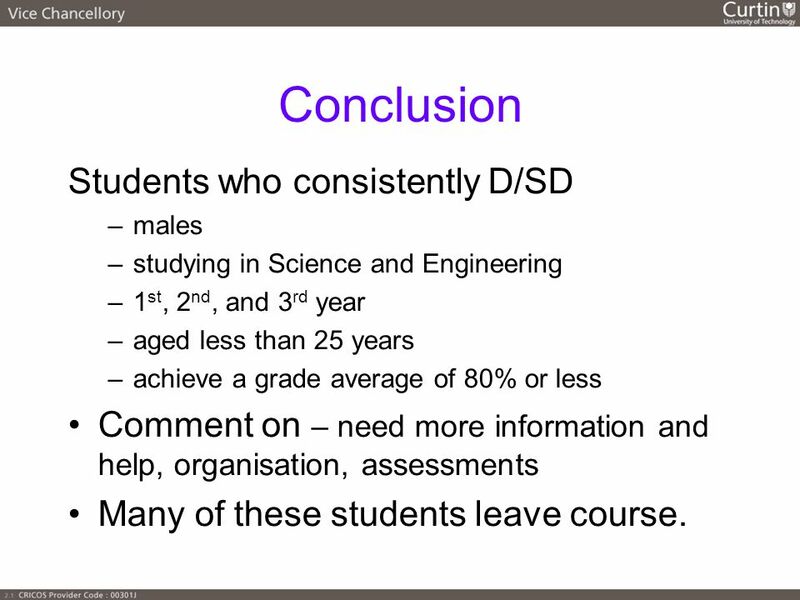 18 Conclusion Students who consistently D/SD –males –studying in Science and Engineering –1 st, 2 nd, and 3 rd year –aged less than 25 years –achieve a grade average of 80% or less Comment on – need more information and help, organisation, assessments Many of these students leave course. 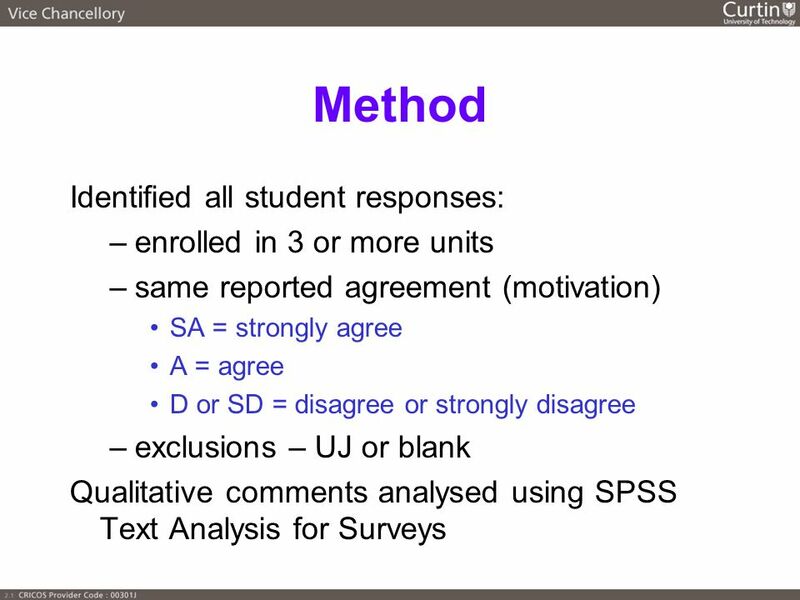 Download ppt "Australasian Higher Education Evaluation Forum (AHEEF) 2008 "Evidence based Decision Making: Scholarship and Practice" 2-3 October, 2008 Australasian Higher." 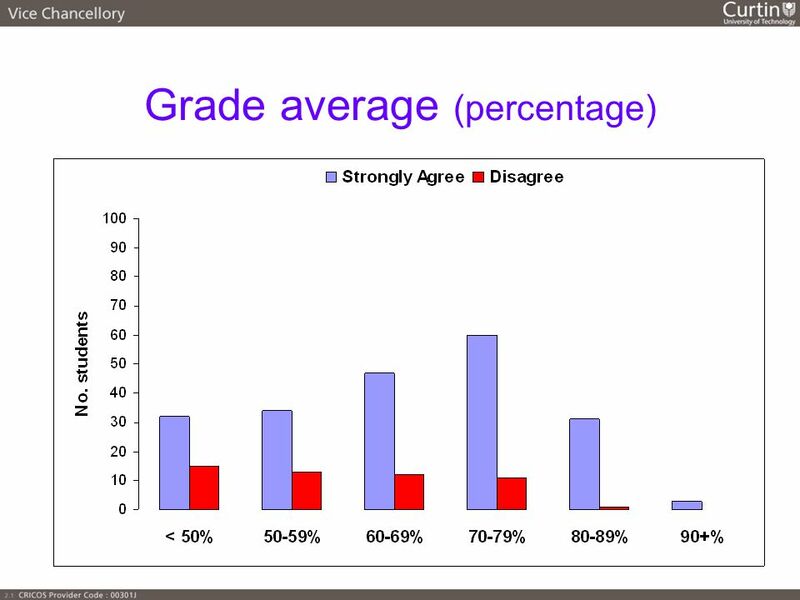 The 1 st National Quality Assurance Conference November 17-18, 2011 Student Feedback on Teaching and Learning at The University of the West Indies, St.
Current and Future Implementation of Response to Intervention. 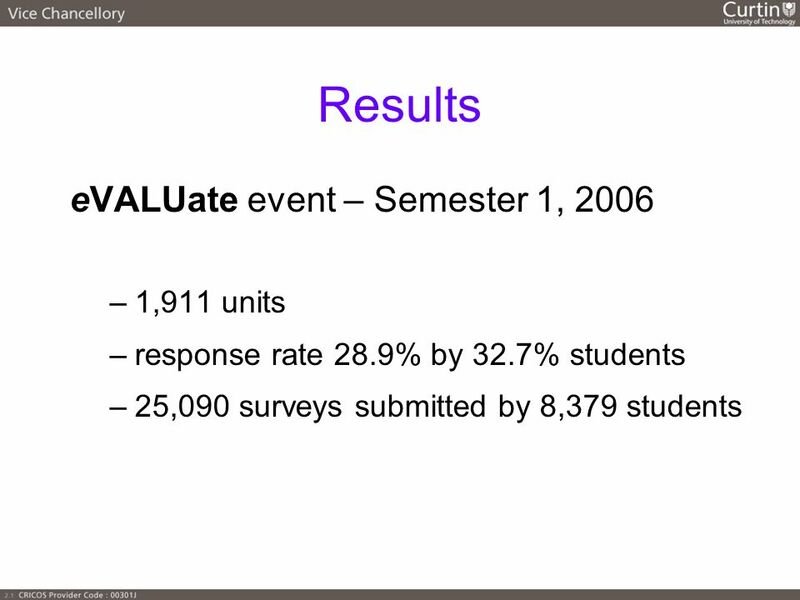 1 Eloise E. Kaizar The Ohio State University Combining Information From Randomized and Observational Data: A Simulation Study June 5, 2008 Joel Greenhouse. 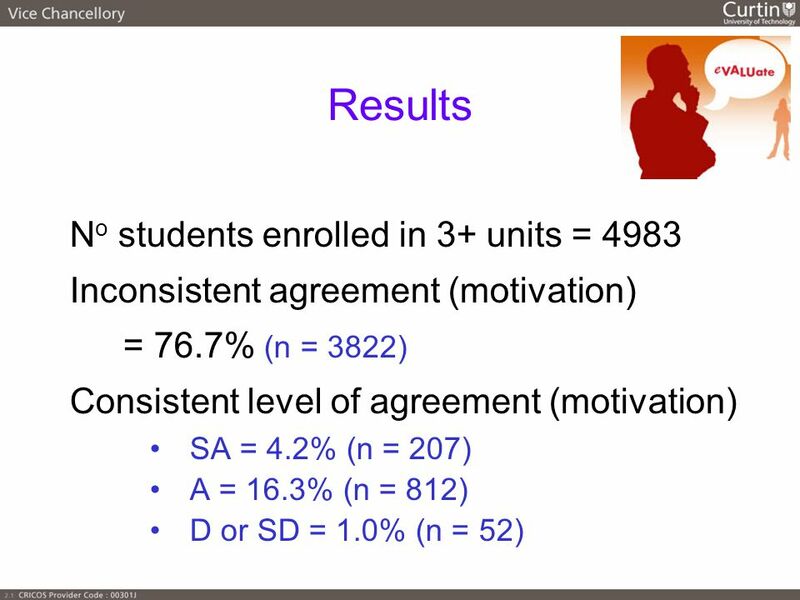 AYP Plan Performance Reporting Division Texas Education Agency TETN Accountability Update November 14, 2006. 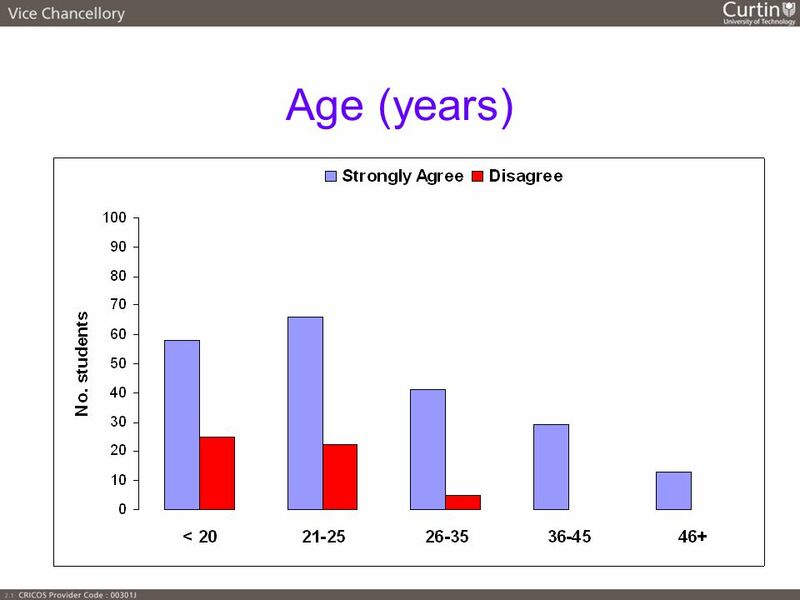 The Course experience questionnaire (P. Ramsden) Designed as a performance indicator 24 statements relating to 5 aspects 1 overall satisfaction statement. 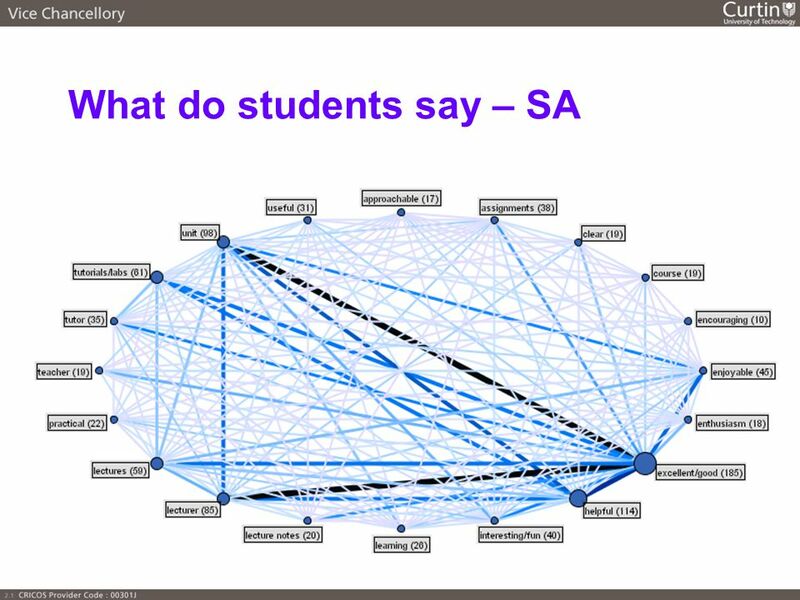 Enhancing the postgraduate research experience: skills, employability and careers Chris Park.